[31 Jul 2018] Prepping for Static Test – E.R.P.S. Members of the K.I.S.S. vehicle team made the trek to the Friends of Amateur Rocketry (F.A.R.) 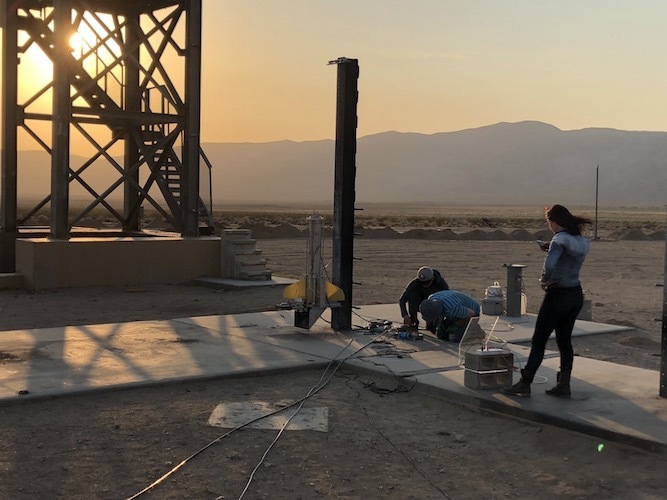 test site in the Mojave Desert to do a static engine test 07 Jul 2018 in preparation for the next K.I.S.S. vehicle launch later this summer. This was the first time we’d been to F.A.R. with hardware to mount, and some adjustments were inevitable. After much work on the engine, linkage and control systems, we discovered that another group had accidentally taken our Control Box while cleaning out their equipment after the 110 degree heat forced a scrub of their launch attempt. Never say die, our band cobbled together parts and “hot-wired” a firing system, but our attempts Saturday were also ineffectual. Regrouping overnight, we went back out Sunday, July 8th and were able to iron out the issues and get a firing completed.